Hello friends! The cards I am sharing today were a gift to a loved one, earlier this fall. The birthday girl had requested an assortment of cards to mail out, and these two were part of that gift. 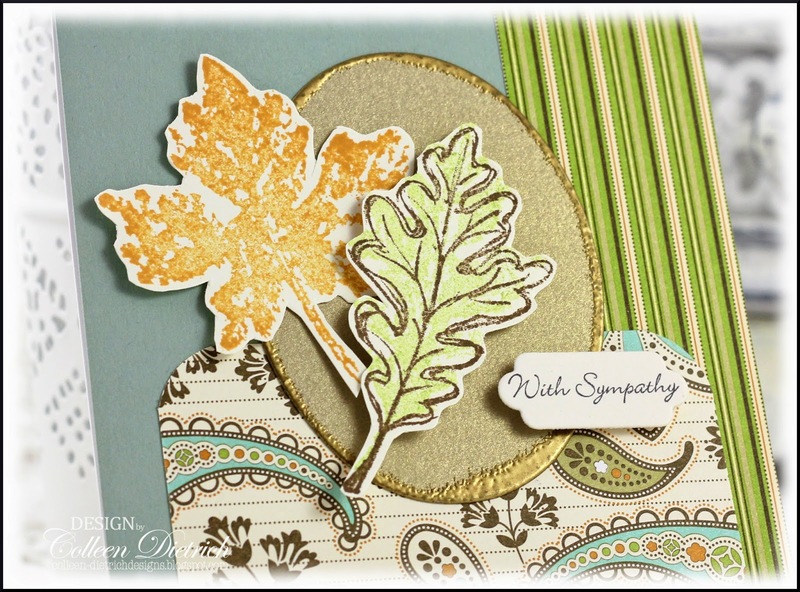 I had a few odds and ends from a marvelous scrap bag (my Stampin' Up! 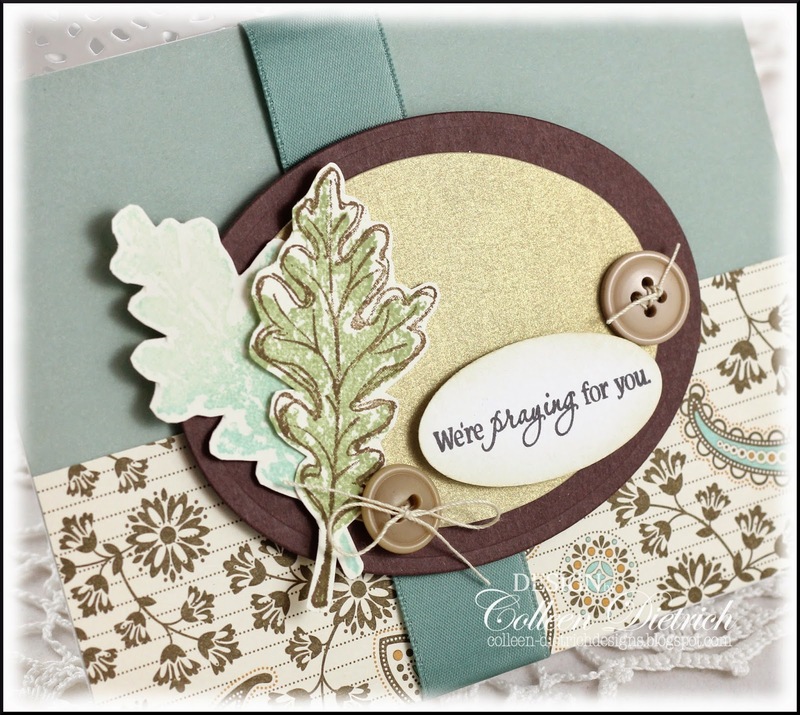 demo, Gail Murray, is THE best :) that inspired me to play: leaves from Gently Falling, already stamped - and some already trimmed out, oval die cuts (love the brushed gold ones), and pretty patterned paper scraps. I used Sage Shadow card bases for each card...the soft color lent itself well. 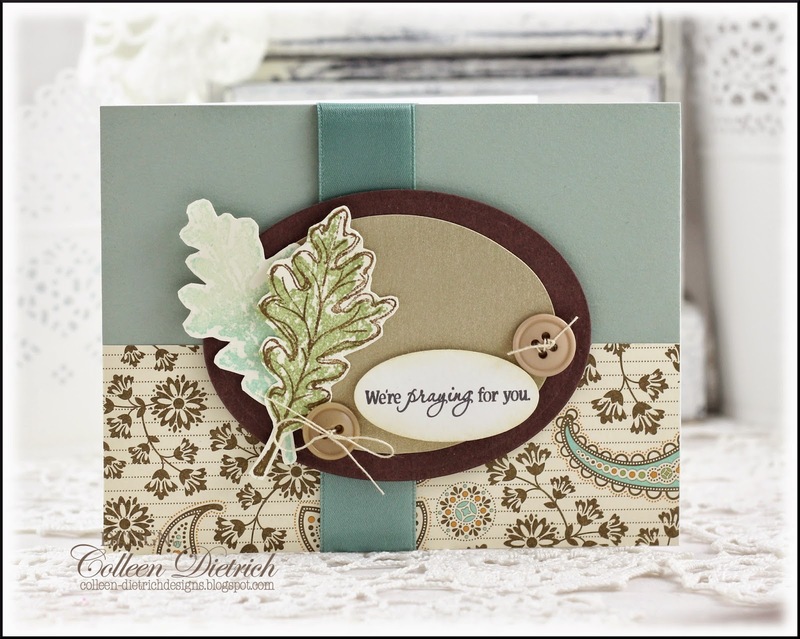 The sentiment on this card is from Verve's Notes of Prayer. The sage satin ribbon is vintage, from my beloved mom-mom. Can't believe how perfectly it matches the card base. More of the same goodies used on the next card. The sentiment is from SU's Teeny Tiny Wishes. This brushed gold oval from a scrap bag had already been edged with gold embossing. Thanks so much for letting me share these with you today! You've done a beautiful job of putting these scraps together, Colleen. The vintage ribbon is a perfect match. Some things are timeless. Lovely cards. These are beautiful! I love love love the colors and the leaves!!!! Colleen both cards are gorgeous. 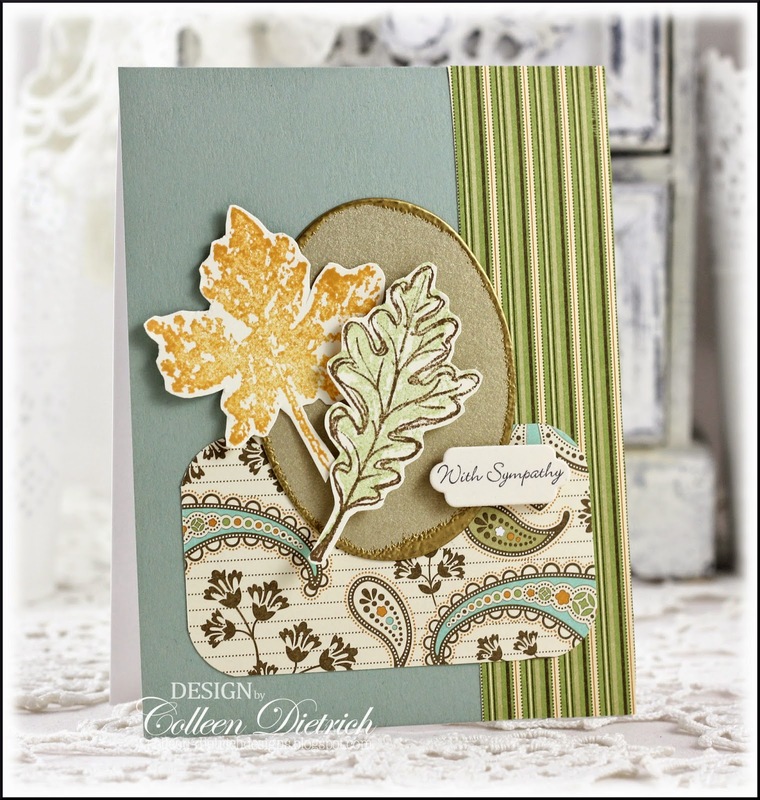 You are able to create the most amazing cards with classic and floral patterns. Wonderful desing and so pretty! So cute!!!! Love the leaves! You are a whiz kid with those SU scraps!! These are beautiful! Hi my friend! Thanks for the visit today ... I don't know what's going on with word verify .. our settings didn't change --- those who didn't have it before -- still have "NO" on our settings -- but what I have noticed is -- you don't have to do it -- I will push "tab" and "enter" after this comment without doing the word verify ... and my comment will still go thru -- just weird!!!! You have such an elegant style Colleen. LOVE the colors in these cards! Such beautiful and simply stated sentiments . I bet your friend was very happy with these. You always do such beautiful work!